Exeter, PA - July 16, 2013 - Quantum Rehab® and Pride Mobility Products® Corporation announced today new developments within their sales divisions to better serve the industry. Quantum Rehab is moving forward with a clinically focused team of field leadership that will work directly with patients, therapists, and providers, and Pride Mobility is developing new retail sales strategies to help providers remain economically viable. Quantum Rehab's Regional Managers will further expand Quantum Rehab's clinical presence by continuing to build relationships with their respective Rehab Product Specialists and partnering with Quantum's Clinical Education team for course development and presentations. They will work to be a catalyst of product development collaboration between consumers, therapists, and ATPs under the continued guidance of the Quantum Corporate Leadership team. Pride Mobility's Field Leadership will also be refining its retail sales focus by developing new strategies that will allow them to work closely with Pride providers on identifying and converting opportunities that increase cash flow. "Due to the ongoing changes within the custom rehab technology and durable medical equipment industry, Quantum Rehab and Pride Mobility continue to make strategic organizational moves to ensure providers and facilities receive the highest level of products and services," said Andrew Pyrih, senior vice president of Domestic Sales. "Quantum and Pride will continue to adapt and evolve in an effort to best serve our clients." Pride Mobility Products® Corporation is the world’s leading designer and manufacturer of mobility products including Jazzy® Power Chairs, Pride® Mobility Scooters, Pride® Lift Chairs, and Pride® Lifts and Ramps.Quantum Rehab®, a Pride Mobility Products Corporation company, manufactures innovative, complex rehab solutions. The company, headquartered in Exeter, Pa., also has operations in Australia, Canada, Italy, the Netherlands, New Zealand, and the United Kingdom. 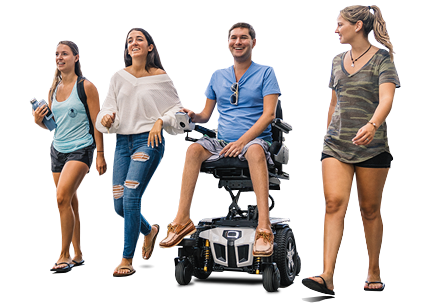 Pride Mobility is dedicated to providing expertly designed, engineered, and tested products incorporating technologically innovative, intelligent features enabling end-users to achieve their mobility goals. For more information, please follow Pride and Quantum on Facebook at www.facebook.com/PrideMobilityProductsCorp and www.facebook.com/QuantumRehab.